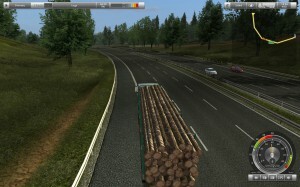 I admit it, I like UK Truck Simulator, I have had loads of fun driving up and down the road network of the UK delivering my furniture here or my logs there. Surprising really, I was expecting to play it for an hour and give up, but I constantly get pulled back into it knowing that I have left it with a delivery due in Plymouth in 12 hours, a long hard slog from Felixstowe. Unfortunately not everything is sunshine and roses with this latest truck simulator from SCS, developers of European Truck Simulator and the 18 Wheels of Steel titles. Simply put it feels incomplete and rushed to release. The game boasts that you can travel to 18 of the largest cities in the UK. Where then I ask are important cities such as Bristol and Leeds? Bristol not appearing is a big bugbear for me; one of my first deliveries in the game took me from Cardiff to Cambridge. Travelling along the M4 after the Severn Bridge (lacking any tolls) was a strange experience without travelling past Bristol. I was constantly wondering where all the towns and cities along the important M4 corridor were. The lack of important cities along the motorways is a grave disappointment. What is worrying is the large number of incomplete and inaccessible roads that you come across. One of the most obvious examples is the missing link road between Southampton and Dover, on the in-game map you can even see the start and end of it just outside the two cities, but you just can’t drive on it. Another puzzling aspect of the road network in the game is the fact that you can only drive into London from the northern stretch of the M25. Why you are unable to enter the city from any other direction is beyond me. These problems with missing roads and a lack of important cities may be some of the more glaring issues, but there are others which have an even greater impact on the realism of the game. Take the motorways, the British speed limit on them is 70mph, in UKTS it is 60mph, it is very annoying to get a speeding fine for travelling at the speed you should be allowed to. Entering a town or city is a bizarre experience, the speed limit suddenly drops from 60 to just 30 even when you are still driving on a dual carriageway. A perfect example of the problems with the speeds in the game comes when you are driving on country roads which are posted at the national speed limit. Coming across cars and trucks travelling at just 30mph leaves you struggling to overtake on the tight twisty lanes. UK Truck Simulator isn’t all bad, it really is quite enjoyable when you look beyond these problems. There is a sense of adventure travelling all around the country making sure you arrive at the depot on time without damaging your cargo. If you arrive late or with a damaged load you will lose some of your earnings, and in the early stages of the game you need every penny you can get. You start the game choosing from one of three companies to work for. You will start with a measly share of the profits from your deliveries driving around in a C class truck which is nice and basic, if a bit slow. Once you increase your reputation through delivering on time without speeding, or delivering damaged, cargo other companies will ask you to work for them with an increased share of delivery profits and a nice new truck thrown into the bargain. During the game a mysterious friend named Steve will send you messages boasting about how great his life has become since he went freelance and set up his own business. Once you have done your fair share of working for others you get to follow in Steve’s footsteps and go freelance. You start off with just yourself and one truck, but once the money is coming in you are able to purchase garages around the map where you can store more trucks. You will also be able to high other drivers to do your dirty work for you. If one of these gelatinous tapeworms isn’t living up to your high standards you can sack him and hire someone new and watch the money roll in. It may be a truck simulator, but it is surprisingly fun to play. It is just a shame that it feels unfinished, hopefully SCS will release a patch to address the problems, even if they don’t add any new cities just making the road network work right would be a great step forward. For now though, UK Truck Simulator has to be a miss. Fun but needs a lot of work under the bonnet. The national speed limit for trucks *is* 60mph, so your speeding tickets were well deserved. To be precise, that’s for “Goods vehicles exceeding 7.5 tonnes maximum laden weight”. Ah interesting there, doesn’t take away from the fact that the speed limit signs are wrong for motorways, regardless of what the vehicle is. Please can someone tell me where can I find the driver agency in UK TRUCK SIMULATOR? Could someone please tell me if there is way of playing the game online. as in play with others at the same time and see them in the gameplay ? Cool, if it’s true. Any info? That is a strange one Ryan, do you have the latest version of the game? Are your graphics drivers up to date? i need to know what companies i can unlock? i have unlocked all the companies but i am not aloud to deliver to the quarry. also is it possible to have a garge in every city? Where can i buy A class truck ? I’m not sure of the actual truck shops, but when you upgrade a garage, (5 trucks/drivers) you can buy them from the management screen. Much easier. i need HEEELp:DWHERE find driver agency …what town ?? Does anyone knows where can i buy Valiant(Volvo)A Class? Earn more money, find a truck dealer and buy a truck. Once you’ve done that, you’re freelance. Forgot to mention, you need to be level 7. It’ll tell you when you get there that you need to go out on your own, as you wont earn anymore experience from working for someone, you have to have your own truck. Hi, I’ve tried looking for a solution to this…but can’t find any. I’ve got all the latest stuff, drivers, patches etc. But, every now and then, when I get a delivery to Plymouth, I get close to the speed limit sign, and the game crashes…just stops dead. I can get around this, by resting just outside Plymouth (at either of the stations) but this does leave me ‘late’. Although I don’t care, (I’m level 67 now…lol), if I do forget to rest, the game crashes…and once I came down from Aberdeen…so I wasn’t best pleased.